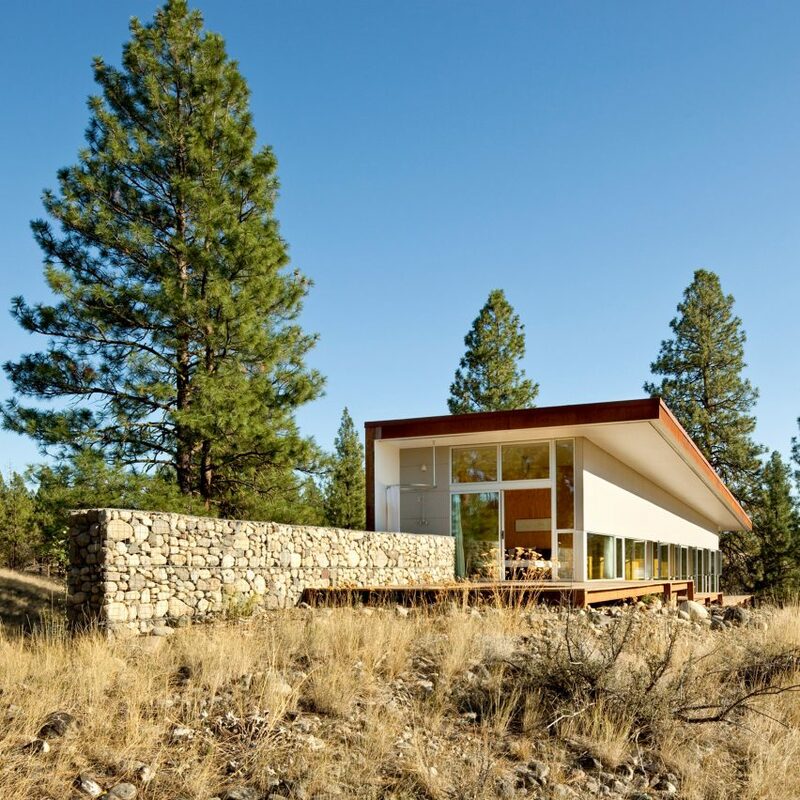 A gabion wall supports this hillside residence in Washington, which local architect David Coleman has perched above a steep, grassy mound. 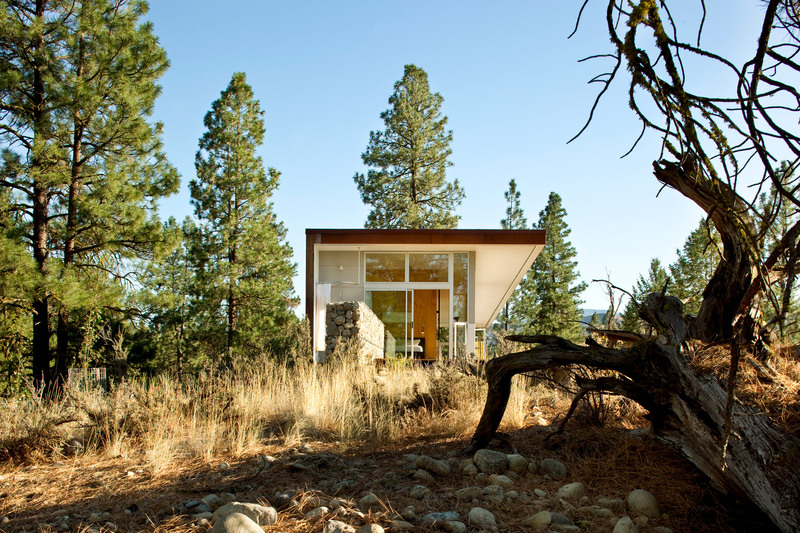 Coleman designed Hill House in Winthrop, Washington, to slot into the surrounding scenery and sloped site. “This is a modest, sustainable building with a big presence in a big landscape,” said Coleman in a project statement. 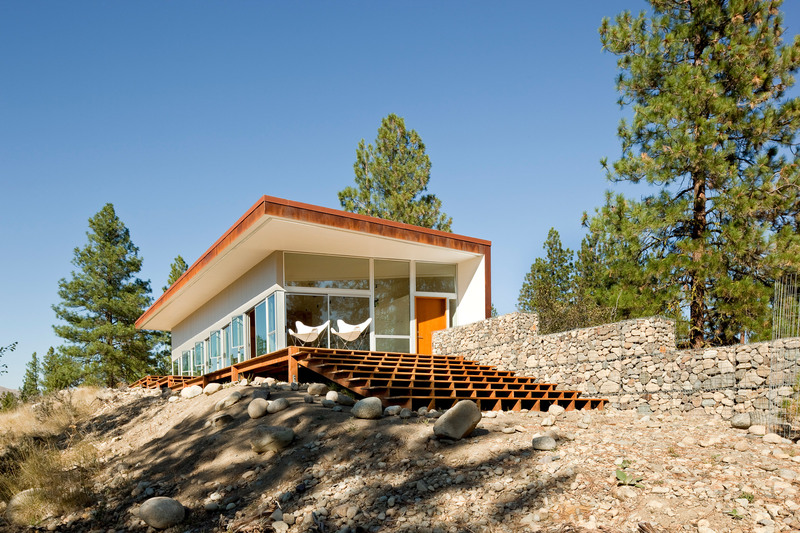 The rectangular property is topped with a flat, wood-framed roof to integrate the project into its sloping site, with a gabion wall supporting one side. “Gabion stone walls, made from the spoils of the excavations and conceived to reduce off-site waste, provide retaining, context and privacy while bridging between building and landscape,” Coleman added. Weathering steel cladding wraps the flat roof and a solid wall to the east. 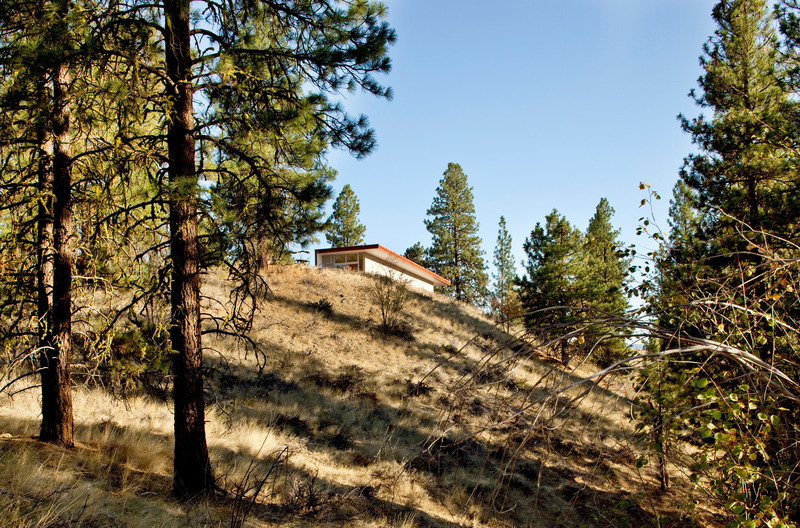 Coleman describes the property as cutting “into the land like a rusty blade, evoking the cultural history of the mining encampments found nearby and providing privacy from the road”. 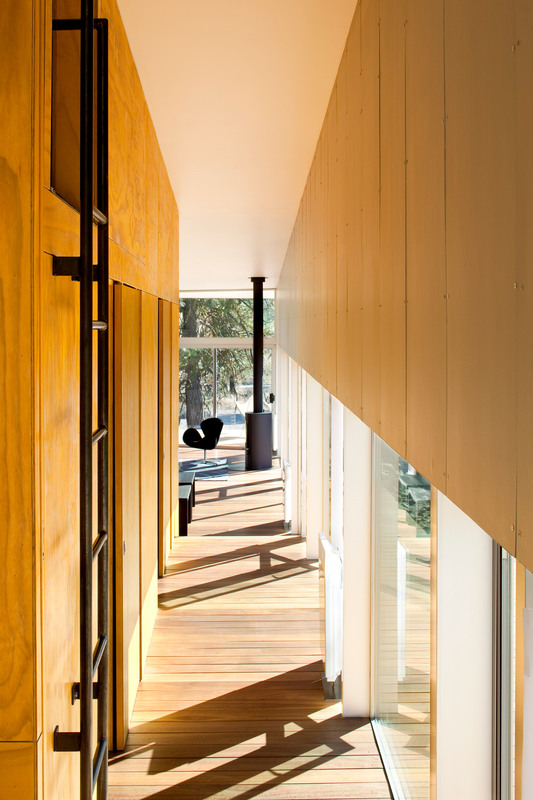 When viewed from the woods nearby, the house’s warm colouring blends with the surrounding tree trunks. The primary structure is composed of a 20-foot (6-metre) wide and 115-foot (35-metre) long stepped platform, which leads up to various parts of the home. Glass windows line the west side of the home offering vistas to the slope below. The shorter walls along the south and north facades are also glazed. 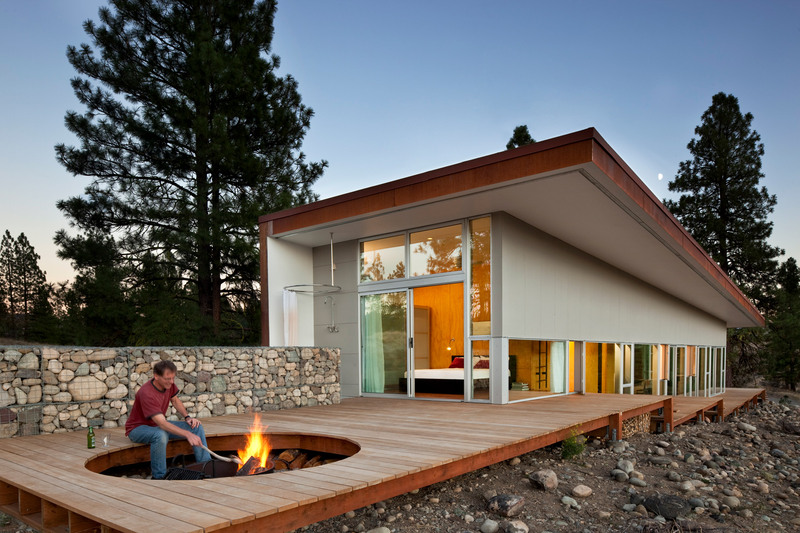 On either end of Hill House is an outdoor deck, doubling the living space for the home. Inside, the residence measures 1,100 square feet (102 square metres) and is arranged around an open-plan kitchen, dining and living room. 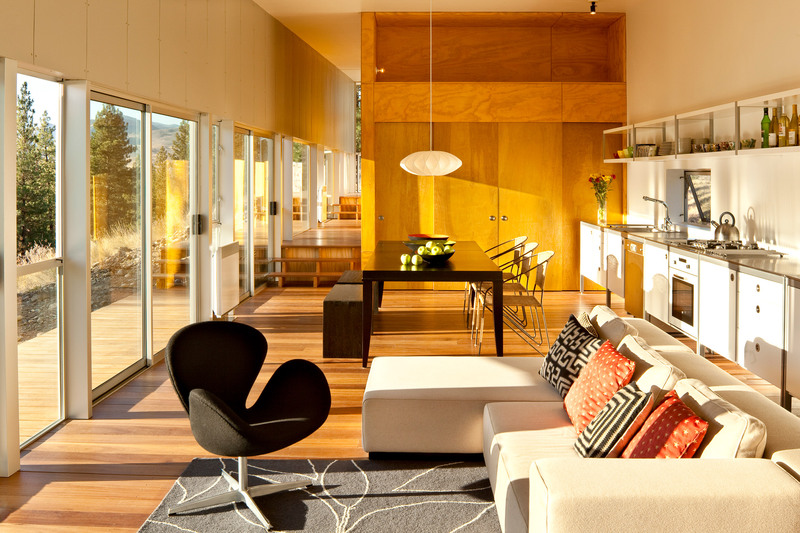 This main area is characterised by high ceilings and a double-height, corner wall wrapped in glass. White kitchen cabinets line one wall and are complete with a desk, while a black dining table and matching bench are placed close by. A sitting area is defined by a cream-coloured sofa, a black chair and a similarly dark fireplace. Steps lead from the dining area to a hallway, which provides accesses to a bedroom with bunkbeds, and a bathroom with a tub and laundry. Another set of small steps leads to a second bedroom at the furthest end of the house. Outside, there is a shower and a firepit. Hill House is designed to adapt to seasons, as it provides a generous amount of outdoor space in the summer months but can be modest and efficient in winter. “The resulting project is conceived as a habitable landscape, a place to gather, shelter and rest, closely aligned with the rugged beauty of the site and responsive to the natural conditions,” Coleman said. 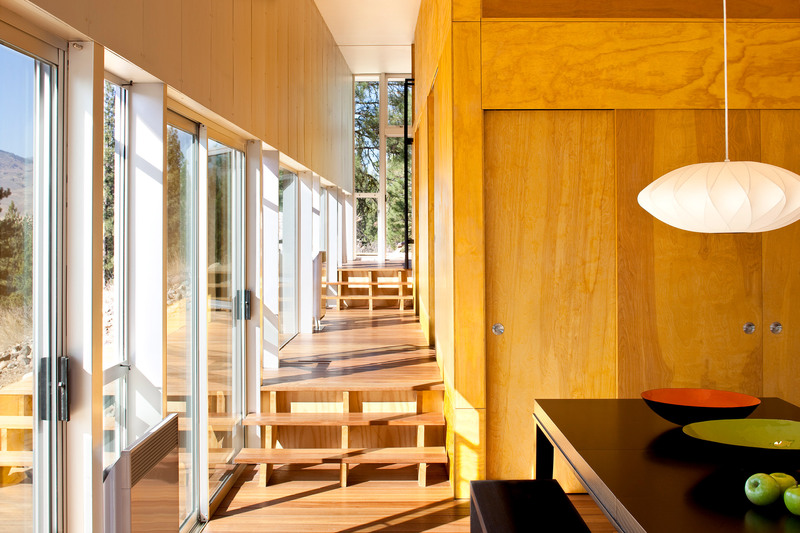 Inside, all of the rooms have wooden floors and walls lined in vertical plywood, which is stained to match the colour of the nearby aspen grove and its golden leaves in autumn. 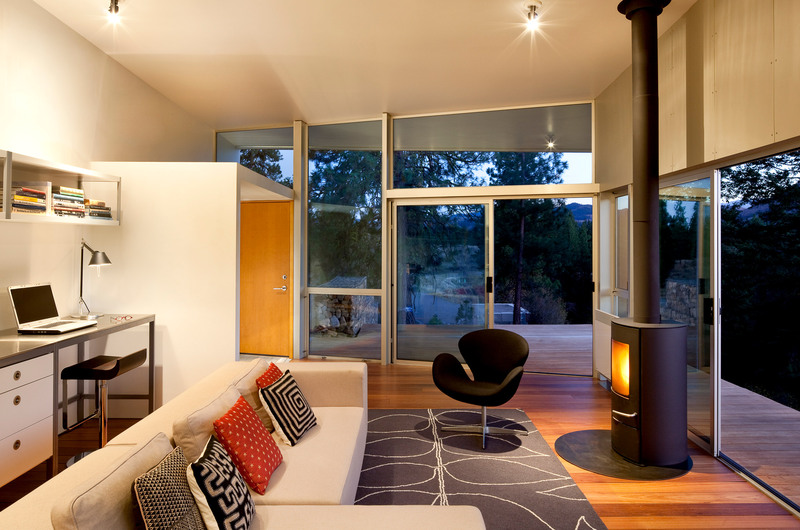 Sustainable materials and techniques are used throughout, including recycled steel, sustainably harvested wood, energy-efficient Blow-in Blanket System (BIBS) insulation, on-demand hot water, low-flow plumbing fixtures and convection heat. 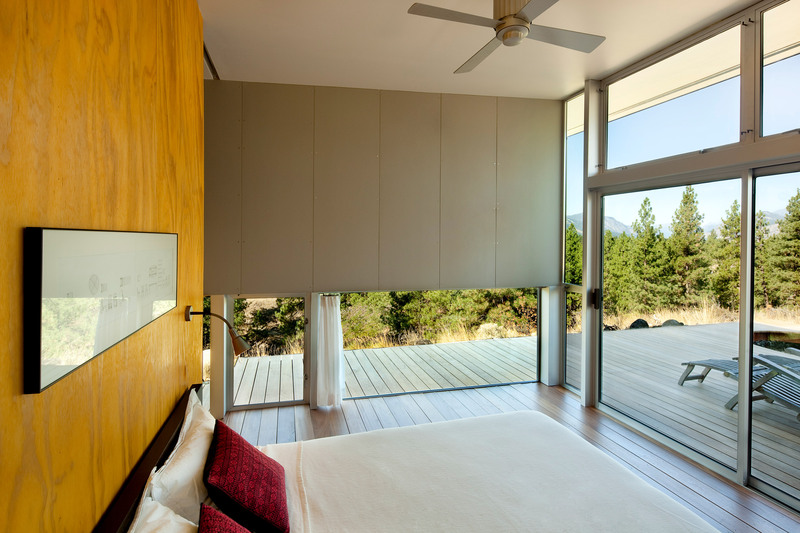 Windows are also designed to encourage passive solar radiation in colder months, and natural ventilation when it is hot. When it is very warm outside, sun shades can be used to protect the windows, and are made from fabric used in local fruit orchards. The roof’s overhang provides further shading. “The result is an elemental building, deceptively simple, deeply rooted in the site and unexpectedly crisp and modern,” the architect said. Hill House is in Winthrop, a small town with pristine forests and stunning views that is popular for outdoor activities. 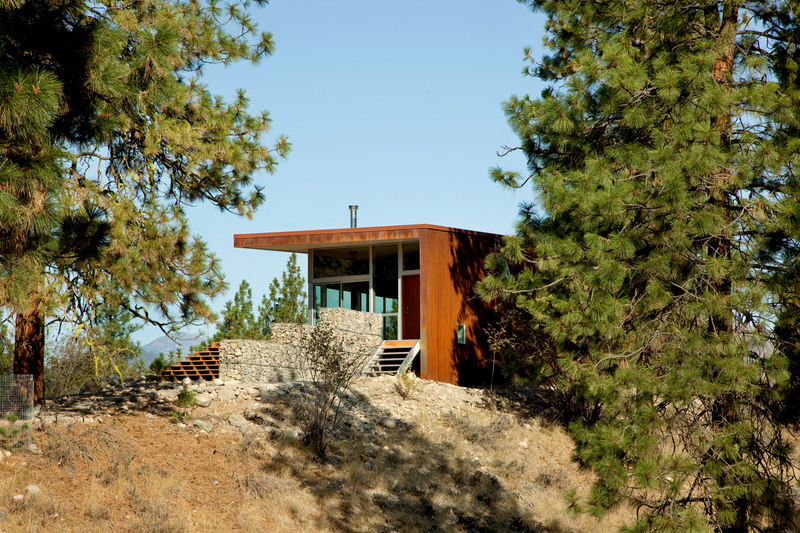 Other rural projects in Washington are a boathouse by Hoedemaker Pfeiffer, a blackened wood home by Robert Hutchison, a cabin with pops of black and yellow by Prentiss Balance Wickline and an artist’s retreat by Olson Kundig. The post David Coleman’s Hill House cuts into Washington hill “like a rusty blade” appeared first on Dezeen.